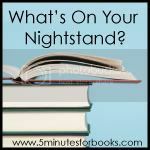 Last year I did my own thing with bi-monthly reading reports, but this year I’m back on the wagon with What’s On Your Nightstand at 5 Minutes for Books. January is almost always a good reading month for me, and this one has been just that. The Pearl by John Steinbeck–my thoughts are here. That means I’m one down and five to go for the Back to the Classics Challenge. The Cay by Theodore Taylor. What a joy it was to revisit this favorite from my childhood! I hope to share some thoughts about this story soon. The last four books are novels-in-verse that I read because I am a second round judge in the poetry category for the 2016 Cybils. I’ve enjoyed this so very much, but mum’s the word on which book I like best until after the awards are announced on February 14. Last but certainly not least, I am pleased to announce that I have finally come to the Harry Potter party (just a couple of decades late). This is actually not the first time I have attempted Harry Potter, nor is it the first time I’ve made it through one of the books (this one, to be exact). However, this time it “stuck.” I listened to the audiobook of Harry Potter and the Sorcerer’s Stone as I walked, drove, or puttered around the house. (I actually started it in 2016 and re-started it–and finished it–this month.) I’m definitely more of a visual than auditory learner, but Jim Dale’s narration of this story is just so good that even I don’t have a terrible time following it. I’ve already started book two. I’m in. Of course, most of my reading time each month consists of reading aloud to my children. This year I’m bringing back my read aloud reporting with the Read Aloud Roundup the last Thursday of each month. Come back this coming Thursday to read more about what we enjoyed together as a family, or better yet, come back and share your own post! January isn’t over yet, so I still have at least one more title I intend to finish before it’s over. Stay tuned! Ah Harry Potter! I finally got onboard with it in 2014 because of the audios. I drive two hours a day so it made sense if I was going to attempt those mammoth books I better do the audios. Jim Dale is a gem. Jim Dale is a gem! I read The Last Fifth Grade book and liked it quite a bit. I’ve read a couple of TerKeurst’s books and had mixed emotions. I thought the first one was her best – How To Be More Than a Good Bible Study Girl. I also read Unglued and Made to Crave and got a lot from each of them. I’ll have to go check out your thoughts on The Pearl – it’s been ages since I read that.